British author Rudyard Kipling wrote the stories that came to be know collectively as The Jungle Book more than a century ago, setting the best-known of the tales in India, where he’d spent his early childhood. It entered the pop-cultural mainstream in 1967 when Walt Disney turned The Jungle Book into a full-length animated musical children’s comedy. Things have certainly changed in the world—and in the world of filmmaking—since then. Director Jon Favreau has steered steely summer blockbusters (the Iron Man franchise) as well as fluffier family fare (Elf), so he was a wise choice—by Disney, again, 40 years down the road—to retool Kipling’s ripping, roaring allegorical fable for a new generation of moviegoers weaned on spectacle as well as sentiment. 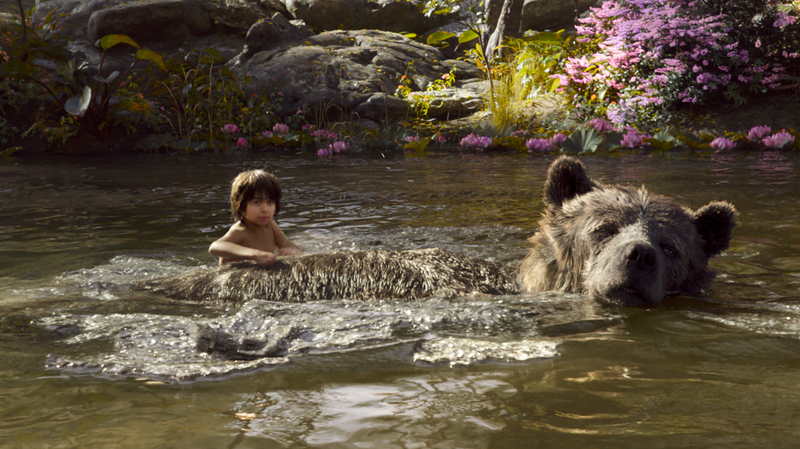 The Jungle Book is the tale of a young boy, Mowgli, raised by a pack of wolves. 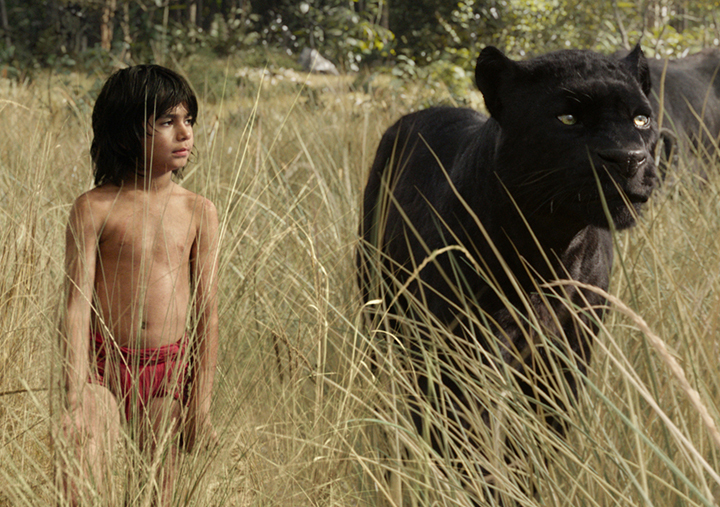 All is well until a fearsome tiger—bearing horrific scars that remind him of what humans can do—catches the scent of the “man cub.” With his life in danger, and knowing that his very presence is a threat to the other creatures, Mowgli begins a journey to rejoin human civilization. 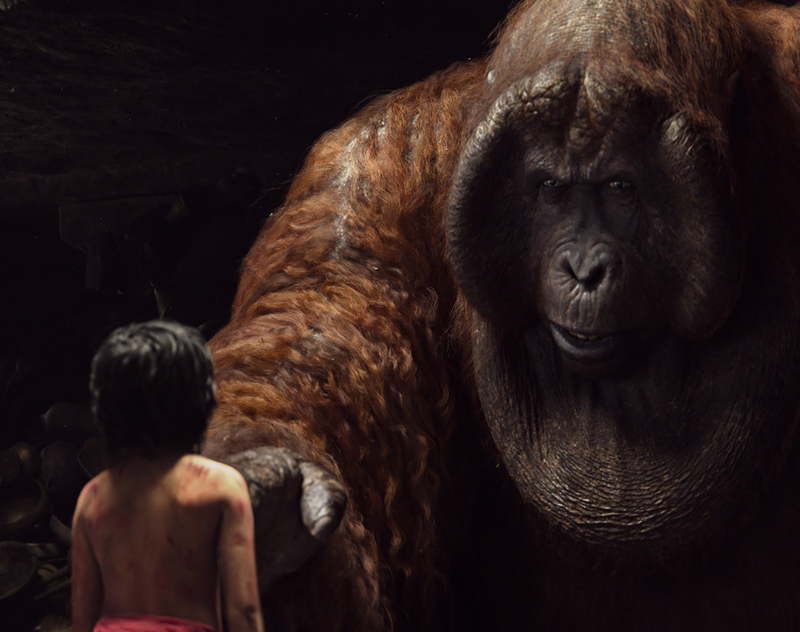 The biggest spectacle the new Jungle Book is the sight of Mowgli (newcomer Neel Sethi, the only human, flesh-and-blood actor onscreen for the entire film, except for a fleeting flashback) in a jungle teeming with wild animals. But none of them are real—they’re all digital effects, down to the last bit of fur, fang and feather. And not only do they look, move and “behave” like real animals, they also talk—constantly. Remember the computer-generated tiger in Life of Pi? Well, imagine it conversing with Pi, and with every other living thing it encounters. Around The Jungle Book’s watering hole, the DirectTV horse, Smokey Bear, the GEICO gecko and Tony the Tiger would feel right at home. 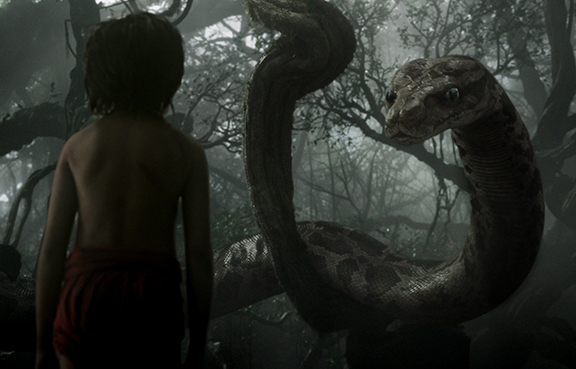 The effects in The Jungle Book are so casually spectacular, you even forget they’re effects. You become so completely, convincingly immersed in the realistic, storybook world, just like Mowgli, it doesn’t seem unnatural that a menagerie of creatures can speak—or sing—just as easily as they can growl, prowl, crawl or climb. The all-star animal voices belong to Bill Murray (the slothful bear Baloo), Scarlett Johannson (the seductive snake Kaa), Lupita Nynog’o (the nurturing wolf Rakasa), Idris Elba (the vengeful tiger Shere Khan), Christopher Walken (the monstrous ape King Louie) Ben Kingsley (the protective panther Bagherra) and the late Gary Shandling (a comically possessive porcupine). Giancarlo Esposito, who plays Sidney Glass in TV’s Once Upon a Time, provides the voice of alpha wolf Akela. It’s rated PG, but there are periods of action, peril and intensity that might be a bit much for very young viewers—especially if their parents, or grandparents, bring them into this Jungle with sugarplum visions of the candy-coated, song-and-dance Disney version. This isn’t that movie; it’s darker, more dangerous—and far superior, in almost every way. It’s the same jungle Rudyard Kipling described 120 years ago, and it’s even got a trio of familiar soundtrack tunes (“Trust in Me,” “The Bare Necessities” and a reworked “I Wanna Be Like You”) from 1967. But it’s come to life in remarkable, resounding new technological, 21st century leaps and bounds. With this outstanding upgrade to yet another childhood classic, Kipling still gets a writing credit, but Disney—as it usually does—again gets the final word.